One of the all-time most original rock bands ever, The B-52's remain alive and well to this date, proving that you can be completely true to yourselves and your music, no matter what trends come and go, and have joyful longevity. Bursting out of the same late 70's Athens, GA rock scene that gave birth to REM, The B-52's couldn't have been more different than what you would envision a rock band to be and sound like. The music blended a number of early 60's influences from surf guitar and girl groups to cheesy garage and frat rock. Doctor Seuss lyrics. A serious love of kitsch. The two women wore tall beehive hairdos you'd expect to find at the corner beauty shop. The lead singer, Fred Schneider, well, he really couldn't sing or perhaps he could, but somehow, it sounded perfect for what they were doing. And who produced this very American band but former Roxy Music keyboardist Brian Eno, before he turned his attention to U2. They were an interesting counterpart to the Talking Heads at that time, who combined African rhythms and art rock, dressed like students, also had a debatable but distinct singer, and that same love of kitsch (especially tabloid news). In grad school, my roommates and I came armed with the first two B-52's records to every party we went to, commandeered the turntable and put one of them on, who cared whose house it was. We were not going to tolerate a party where the music was like that mopey Stephen Bishop character who strummed a guitar on a staircase in "Animal House," crooning "I gave my love a cherry, that had no stone!" Hell, no. We wanted a real party and The B-52's were going to deliver. 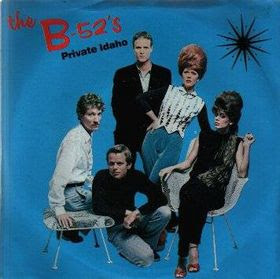 Heavy on that surf grinding Strat, "Private Idaho" was typical B-52's danceable nonsense, in the best possible sense. That stinging guitar and snappy snare, the girls piping in with their "hoo-hoo-hoo-hoo-hoo." Like "Seinfeld," the B-52's were going to teach you nothing. There was no lesson. It was artificial and silly, with a great dance beat. My favorite part of "Private Idaho" was after every chorus, when there was a rumbling tom-tom surf beat , building up with the twangy guitar and then five monsterously deep slams on the drums before jumping right back in to the song's main riff.